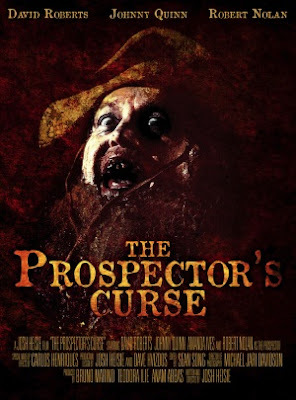 Back at the start of 2012 I posted some news about a Canadian made Western themed horror short titled The Prospector's Curse. This has now been finished and I have had the pleasure of seeing it. Set during the American gold rush The Prospector's Curse follows two criminals on the run from a nearby settlement. 'Tubby' Ellsworth has murdered a man sleeping with a prostitute he was in love with, while Jack is a confidence trickster. While up in the mountains they encounter a dying prospector who begs the two men to give him a Christian burial and to also deliver a pouch of gold nuggets to his soon to be widow. Greed takes over the two men and they instead leave his body to rot and decide to find the source of the gold. However at night the spirit of the prospector comes to haunt them in revenge for their broken promises. This is a fifteen minute short that while clearly not on a huge budget manages to create the atmosphere of the wild west, it has a fantastic Western theme playing through out and the actors all look the part with their clothes and mannerisms taken to levels of stereotype that gives it a comfortable feeling. Johnny Quinn; a Quentin Tarantino lookalike is fantastic as the swindler Jack, while David Roberts as Tubby brings some comedy to his role with his anger management issues. The Prospector himself is well made up to give him a disgusting look. The Prospector's Curse is not a film I would call creepy, scary, or horrific but it is a decent enough morality tale. 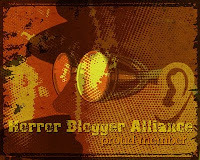 Where the film succeeds is its embracing of all the Western tropes that give it a warm feel and got me in the mood for some of the Western classics. It is true that some of the acting is a bit off, and the closed locations reduce some of the sense of scale the genre is known for but this was an enjoyable fifteen minutes that I am glad I got to see. The trailer can be seen here.